Mu opioid receptor constitutive activity. 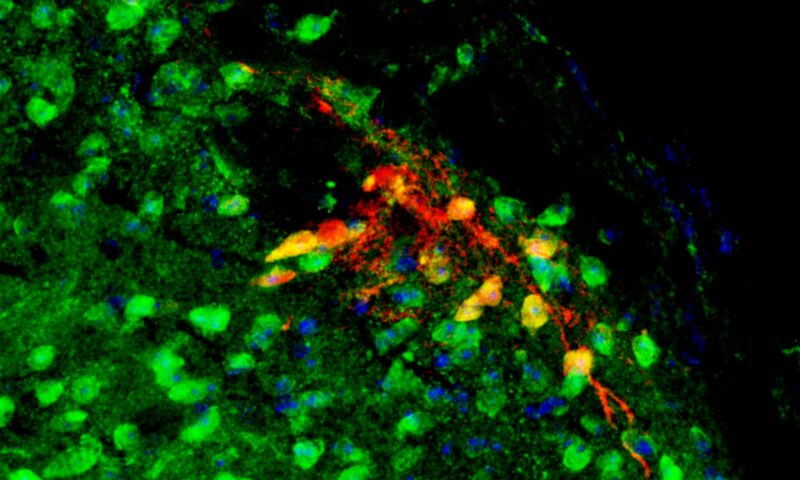 This large R01 in collaboration with Suzanne Doolen studies clinical pain patients and mouse models of latent sensitization (LS). It is based on Dr. Taylor’s work showing that tissue inflammation produces an LS that is masked by spinal mu opioid receptor (MOR) signaling for months, even after complete recovery from injury and re-establishment of normal pain thresholds. Disruption with MOR inverse agonists reinstates pain and precipitates cellular, somatic and aversive signs of physical withdrawal; this phenomenon requires N-methyl-D-aspartate receptor-mediated activation of calcium-sensitive adenylyl cyclase type 1 (AC1). His grant tests a new conceptual model of the transition from acute to chronic pain, based on the delicate balance between LS and endogenous analgesia that develops after painful tissue injury (Taylor and Corder, 2014). First, injury activates pain pathways. Second, the spinal cord establishes MOR constitutive activity (MORCA) as it attempts to control pain. Third, over time, the body becomes dependent on MORCA, which paradoxically sensitizes pain pathways. Stress or injury escalates opposing inhibitory and excitatory influences on nociceptive processing as a pathological consequence of increased endogenous opioid receptor tone. Pain begets MORCA begets pain vulnerability in a vicious cycle. The final result is a silent insidious state characterized by the escalation of two opposing excitatory and inhibitory influences on pain transmission: LS mediated by AC1 (which maintains the accelerator), and pain inhibition mediated by MORCA (which maintains the brake). This raises the prospect that opposing homeostatic interactions between MORCA analgesia and latent NMDAR–AC1-mediated pain sensitization create a lasting vulnerability to develop chronic pain. Thus, chronic pain syndromes may result from a failure in constitutive signaling of spinal MORs and a loss of endogenous analgesic control. Dr. Taylor’s paper underlying this working hypothesis (Corder et al, 2013) was featured on the cover of the September 20, 2013 issue of Science, was accompanied by an Editor’s cover story, was the focus of several news stories (e.g. The Scientist, Businessweek, Nature Medicine, Pain Research Forum), and was later announced in 2014 as the annual “Top Science Advance in Pain Research” by the NIH Interagency Pain Research Coordinating Committee. Clinical Studies. Aim 1: The first experiments conducted in human volunteers (NCT02684669) has already demonstrated that naloxone reinstates secondary hyperalgesia after mild heat injury – a direct translation of Dr. Taylor’s animal studies published in Science. This data was highlighted in the translational symposium which Dr. Taylor developed and chaired at the 2017 American Pain Society meeting in Pittsburgh. To extend his studies to postoperative pain, Dr. Taylor’s lab is now close to completing recruitment of postoperative patients following third molar extraction (NCT02976337) and groin hernia repair (NCT01992146). They are also setting up analogous studies in other forms of post-operative pain. Positive results would indicate that surgery sets up a long-lasting, compensatory increase in endogenous opioid receptor analgesia that prevents the transition from acute to chronic postoperative pain. If true, then it could be predicted that anything that causes this pain inhibitory system to fail, such as stress, would be associated with the development of chronic postoperative pain. Basic science studies, Aims 2-4 use patch clamp electrophysiology of adult spinal neurons and behavioral pharmacology to understand the neurobiological mechanisms of latent sensitization (including pre and post-synaptic plasticity at multiple NMDA receptor subtypes) and its inhibition by tonic inhibitory GPCR activity (including MOR, kappa opioid, and cannabinoid CB1 and CB2 receptors). Because of the close interplay between stress, chronic pain relapse, and addiction, Dr. Taylor is launching a new project to test the hypothesis that stress will reduce MORCA, thus unleashing a pain episode. With this work, Dr. Taylor’s lab hopes to ultimately generate clinical trials to either: a) facilitate endogenous opioid receptor analgesia, thus restricting chronic pain within a state of remission; or b) extinguish chronic pain altogether. Springborg AD, Jensen EK, Taylor BK, Werner MU. Effects of target-controlled infusion of high-dose naloxone on pain and hyperalgesia in a human thermal injury model: a study protocol: A randomized, double-blind, placebo-controlled, crossover trial with an enriched design. Medicine (Baltimore). 2016, 95(46):e5336. Pereira MP, Donahue RR, Dahl JB, Werner M, Taylor BK, Werner M.U. Endogenous Opioid-Masked Latent Pain Sensitization: Studies from Mouse to Human. PLoS One. 2015, 25;10(8):e0134441. Taylor BK, Corder G. Endogenous analgesia, dependence, and latent pain sensitization. Current Topics in Behavioral Neuroscience 2014, 20:283-325. Corder G, Doolen S, Donahue RR, Winter MK, Jutras BL, He Y, Hu X, Wieskopf JS, Mogil JS, Storm DR, Wang ZJ, McCarson KE, Taylor BK. Constitutive µ-opioid receptor activity leads to long-term endogenous analgesia and dependence. Science. 2013 20;341(6152):1394-9.